We select the best mechanical pencils, whether you need them for writing or drawing. In this article, we're going to help you pick the best mechanical pencil for you. We'll start by explaining exactly what a mechanical pencil is and what to look for when choosing one, before running through our picks for the best mechanical pencils for drawing and for writing. If you're a traditional artist or a creative who loves nothing more than to take a screen break and spend an afternoon immersed in your sketchbook, then you'll know better than anyone that finding a pencil that's comfortable to use for long periods of time is essential. Mechanical pencils have been around for years, and there are many models that cater specifically to artists and designers who will be holding them all day. For those of you not in the know, a mechanical pencil is one that you don’t have to sharpen. That's because the graphite (aka the 'lead') is not bonded to the outer casing, as in a traditional wooden pencil, but is mechanically extended as you write or draw. When the lead runs out on a mechanical pencil, you just insert a new one. This not only saves you a lot of hassle and mess, it also means mechanical pencils can provide more consistent lines, enabling you to create more precise drawings and neater handwriting. That makes them the obvious choice for technical draftsmanship, of course, but that’s not all they're good for. Many artists prefer using a mechanical pencil even for more expressive and imaginative work, as the finer lines produced are usually easier to erase. They may also prefer them from an ergonomic standpoint, because a mechanical pencil's size and weight remains consistent, whereas a wood pencil gets finer the more you sharpen it. Finally, whether you’re using a pencil for writing or drawing, mechanical pencils are cost-effective and convenient, because you only need to replace the lead once it has run out, not the whole pencil. But if you're really not feeling them and are more into wooden pencils, be sure to take a look at our list of the best pencils around right now. There is a wide range of mechanical pencils on the market, and so there are certain things to consider when choosing one. The first is the diameter of the lead you wish to use. If you wish to draw very fine lines, you’ll want to go for a 0.3mm lead. For writing and most drawing, you’ll probably prefer a 0.5mm lead. A thicker, 0.7mm lead, meanwhile, may be better for sketching and non-detailed drawing. Other sizes are also available for specialist uses. Another consideration is the hardness of the lead. A soft lead is darker and more prone to smudging, while a hard lead is better for leaving light, fine lines. Softness is represented by a number followed by ‘B’; the higher the number, the softer the lead. Hardness is represented by a number followed by ‘H’; the higher the number, the harder the lead. Finally, ‘F’ and ‘HB’ leads lie in the middle. Also think about the mechanism you wish to use to advance your lead. The three most common mechanisms are a push-button, which may be on the side or the top; a twist operation, which is more often seen in older models; and a 'shake' advance. Weight is also important, as is grip: some pencils have special features, such as a bumpy texture, to improve this. Whether you use pencils for quick sketches, technical draftsmanship or completed artworks, mechanical pencils have a lot to offer. Here we present our pick of the best mechanical pencils for drawing purposes. Our pick for the best mechanical pencil for drawing overall is the Uni Kurutoga Pipe Slide, which has a big point of difference over most of its rivals. When you use a regular mechanical pencil, the lead wears down on one side, forming a slanted, wedge-shaped tip. This can potentially cause variations in line thickness as you draw. The Kura Toga avoids this through a clever lead rotation mechanism that continually rotates the pencil lead as you write. A spring-loaded clutch twists the lead a tiny degree every time you lift the pencil from the paper, and this allows for a uniform wearing of the lead, and cleaner and more consistent lines as a result. Cartoonist and designer Jason Li is among the Kurutoga's many fans. "It's been my mechanical pencil of choice for several years running, and most recently I got a Studio Ghibli skinned one," he enthuses. "I use it for drawing, sketching things out, and taking notes. I love the mechanism that sharpens the lead as it turns, the (emergency) eraser hidden under its case, and really, the fact that it's chosen to be the model for official Studio Ghibli merch is also a feature in my book!" You don't have to spend a lot of money to get a good mechanical pencil. There are some excellent models out there that are surprisingly cheap, and our favourite budget-friendly model has to be the Pentel 200. "The Pentel P200 is a good, solid choice," agrees freelance illustrator Simon Whittaker, who tends to use them for general sketching. "It's only a couple of quid, they last ages, and they're really nice to hold. They're like the Jotter of mechanical pencils; a good all-rounder. "I remember first using them when I was at school," he adds. "Later, I picked one up again as a cheap spare, and then remembered how nice they are to draw with. Plus, because they’re pretty cheap, if you were to lose one, it’s not the end of the world." Izzy Burton, art director and concept artist at animation studio Blue Zoo, is also a Pentel fan; she favours the 0.7mm version. The brand originally came to her attention, she recalls, because: "I saw a lot of artists on Instagram using Pentel for their drawings and they all recommended it in their FAQs. I use it for precise and finished work, or work that’s on a small scale." We've established that you don't need to spend a fortune to get a decent mechanical pen for drawing. But what if you want to splash out, and buy something really special? In this case, we'd highly recommend the Rotring 800. This top-of-the-range model is infused with high-quality engineering and aimed at the serious artist or draughtsman. With a good weight (almost 91g), the metal body feels solid in the hand. And the non-slip metal grip 'twist and click' retractable mechanism means it's very easy and comfortable to use, even over lengthy sessions. Its hexagonal shape also makes it less like to slide off your desk, or even a slanted surface. In short, if you're working on something special, working for long periods, looking for a gift, or just want a pencil that's super-nice to use, the Rotring 800 ticks our boxes. Featuring a 4mm fixed sleeve for template work and technical drawings, the Pentel Graphgear 500 is the perfect pencil for technical drawing. With its metallic-mesh grip and a barrel weighted at your fingertips, it's designed to help you draw precisely and with a feeling of control. It works with a variety of lead thicknesses, and there's also a built-in lead hardness indicator to help you identify your lead type quickly and easily. The weight feels good in the hand, but light enough to make it comfortable over long sessions. In short, this is the best mechanical pencil for drafting and precision work on the market today, and all at a very affordable price. If you primarily want to use your mechanical pencil for writing, then among your main considerations will be comfort; no one wants an aching hand after a long stretch of writing. But as for drawing, you'll also want your writing to look nice, and that demands a pencil that can produce clean, consistent lines. Here are our four best mechanical pencils for writing. If you want a mechanical pencil for writing, then we would recommend the LAMY 2000. Based on the well-known fountain pen of the same name, designed by Gerd A. Müller in 1996, this is nothing less than a modern classic. It's light enough to be flexible, but solid enough to feel dependable. It's comfortable to hold and use, and produces smooth, consistent handwriting. And its build quality is also noticeably impressive; this is a pen that you can expect to last for years. There's not a huge amount to say beyond that... because rather than use gimmicks, its makers instead focused on doing one thing, and doing it well. The LAMY 2000 is, in short, a delightful pen to use for writing, as well as being supremely reliable and durable. And while it might cost a bit more than rivals, it's certainly a case of getting what you pay for. The Uni Kurutoga Roulette comes in at a surprisingly low price given its high quality, making it the best value mechanical pencil we've found for writing. For one, it's comfortable to hold, with a nicely balanced weight and a knurled metal fingerplate for better grip. And for two, its clever design, matching that of the Uni Kurutoga Pipe Slide (our number one mechanical pencil for drawing, above), means that it sharpens the lead as you write. As with its sibling, that means you get a super-even stroke width that helps make your handwriting neat, polished and attractive. This model from American Classic is a little pricey. But if you want a mechanical pencil for writing you can truly rely on, this has a lot to recommend it. Popular for decades amongst the armed forces and public institutions of the US, the American has a strong reputation for its reliability, durability and clean lines. 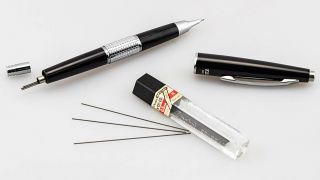 The thick 0.9mm lead is also super-tough and rarely breaks. And overall, this should last a lifetime should you take care of it, which puts the slightly high cost into perspective. Handcrafted using watchmakers' tools for precision, beauty and accuracy, this is another quite pricey, but very high-end mechanical pencil. The tip of the Pentel Sharp Kerry Mechanical Pencil 0.5mm is solid and well-made, which means that breakage of the lead is a rare occurrence. The removable cap makes it super-portable. But above all, this mechanical pencil has been in production for many years now, for one good reason: its impressive consistency and quality. And that makes it an excellent choice for anyone wishing to produce professional looking writing that's likely to be viewed by customers, colleagues or superiors.